It looks like a problem that refuses to go away. What is it and why does it matter? Well, anti-semitism is hostility to, prejudice, or discrimination against Jews, and if current allegations spread across the media are found to be true, they will be by no means unique. Indeed, anti-semitism has dogged the whole of mankind in one way or another for as long as there have been Jews. The contribution of Jews to whichever country they have found themselves in has never been in doubt. Even their bitterest enemies grudgingly admit that they are a brilliant and ingenious race. Industrious, inventive and skilful, Jews have risen to the top of their social class wherever they have resided. Until, that is, the next pogrom or bout of persecution has toppled them to pariah status or forced them to run for their lives. Logically, national governments would be better off harnessing the Jewish ability to do well and supply them with the resources to enrich their host nation. If pre-war Germany had utilised the brilliance of Jewish theoretical scientists like Max Born, Hitler could have had the Nuclear Bomb long before the Allies. Instead he chose to eradicate the same people, thus creating a rapid and disastrous brain-drain arguably at the point when they were most needed. Over 1500 scientists fled pre-war Germany to friendly countries like Britain where their research undoubtedly helped sway the balance of the war. You only have to consider the nation of Israel. It has, not inaccurately, been described as the third superpower. It bristles with advanced technology, hosts research facilities from developed nations like America anxious to exploit its creative qualities. There are more Nobel prize-winners from the Jewish race then from any other. But this doesn’t answer the question: why do we see so much anti-semitism? And you shall remember the LORD your God, for it is He who gives you power to get wealth, that He may establish His covenant which He swore to your fathers, as it is this day. ‘The power to get wealth’ a phrase with a neat summary. Wherever they have roamed and settled, they seem to have an uncanny knack of accruing money, so much so that when Shakespeare wrote the play; ‘The Merchant of Venice,’ the central villain, Shylock, a grasping, scheming money-lender was a caricature that audiences across Europe would have instantly recognised. It reinforced the perception that Jews and money, were as linked in people’s psyche as the combination of a horse and carriage. And this ability to ‘get wealth’ perhaps causes resentment that can spill over into outright harm. 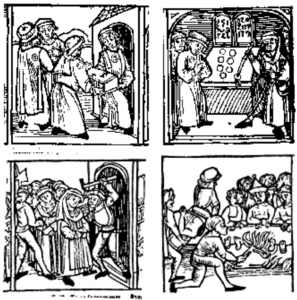 A fifteenth century German woodcut depicts Jews accused of desecration of Christian relics. For this unproved offence they were burned alive. And this became typical of countries the world over. It prompts another Biblical verse, again from the book of Deuteronomy, this time chapter 28v64-65 because the Jews were warned of what would happen if they failed to keep up their side of the covenant with God. …And among those nations you shall find no rest, nor shall the sole of your foot have a resting place; but there the LORD will give you a trembling heart, failing eyes, and anguish of soul. So why would we be interested in this on a bible centred website? Jeremiah’s prophecy (chap 31v10) closes the story of the endless persecution. 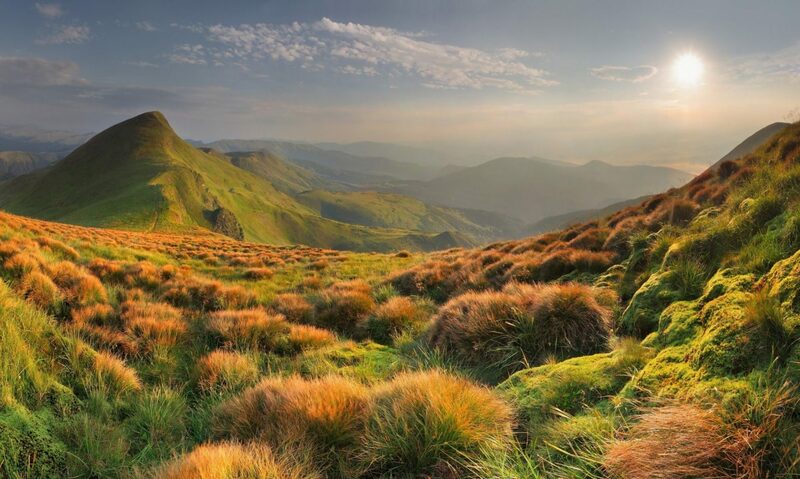 ‘He who scattered Israel will gather him, and keep him as a shepherd does his flock. Another aspect, and in many ways the most profound, of Israel as ‘God’s witnesses’ is Israel regathered as a nation, the Jews driven out of all the nations through which they wandered and drawn like iron filings to the magnet of their homeland (Isaiah 11v12) and the story is almost complete. But not quite. The story of the wandering Jew is one that reverberates with heartache and sorrow. And the Bible tells us there is more to come. More international irrational hatred of God’s witnesses until it rises in concerted acts of fury to try one more time to wipe out the race. This and much more that the Bible urgently warns us about as our world races to the precipice and beyond. So, whatever happens with this current focus on anti-semitism, be assured that we should not be in the least surprised. It is the witness of God, to events that will change the world forever, and ultimately herald a new age of peace and righteousness. The only distinction will be towards those who do not accept the rule of the ‘Prince of Peace’, that Jewish, son of David, the Lord Jesus Christ, who will come in power to reign on this earth.